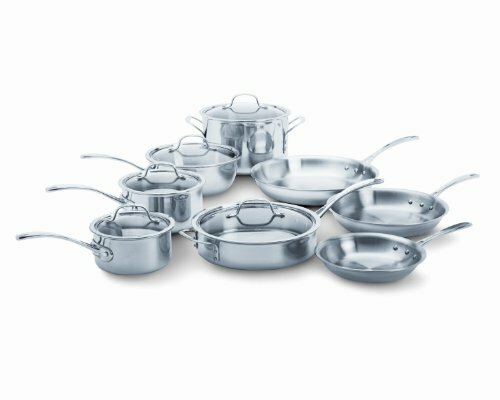 Low quality cookware is rampantly taking over the pots and pans realm and it makes no sense - buying a $30 set of generic pans from Wal-Mart every year for ten years is not cost-effective compared to owning a $200 high-quality set for the same amount of time. But getting stuck with a $200 set of pans that cracks, breaks, or loses its nonstick coating after that first year can be a real letdown. Fear not, as we have investigated the top cookware brands and what they have to offer. Let us save you the research time and help you find what's right for you. We won’t choose one over the other, as they are all stellar options, but we will provide you with the facts, features, inclusions, and many other pieces of information. 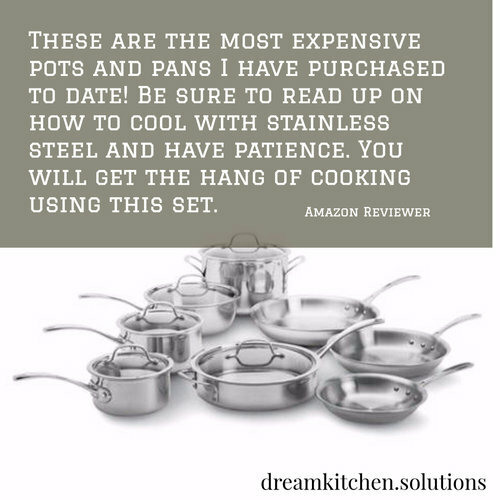 This info will give you the opportunity to make an informed decision on the last set of pans you may ever need to buy. Additionally, the package includes five lids, bringing the total piece count to 13. One thing that you may notice when looking over the above inclusion list is the presence of three omelet pans, and zero skillets or drying pans. Digging into this anomaly shows that, while the “skillet” and “frying pan” are typically interchangeable in terms of wording, the omelet pan is in its own world. An omelet pan is a shallower frying pan with gently sloping sides and an outturned edge, simplifying the process of sliding an omelet out once cooked. However, for skillet cooking or frying, an omelet pan will serve the exact same purpose. Verdict: Unless you are a professional chef and specifically need a skillet or frying pan as opposed to almost the exact same thing with a different name, you should have no problems with the Calphalon set. The Calphalon Tri-Ply Stainless Steel set is comprised of a triple-layer sandwich design. The outer layer is stainless steel, as is the inner layer. This means that only the steel is touching both the heating surface and your cooking food. In between these layers of stainless steel is a thick layer of heavy-gauge aluminum. This aluminum layer provides a rapid and even heating process, and extends up the sides of the pan, providing precise distribution of heat to your food. The handles of the Calphalon pan set have three rivets securing them to the pan versus the usual two, ensuring a sturdy, steady connection. These three bolts fastening the handle to the pan work worlds better than a low-quality pan set’s welded-on handle. This comes with the potential disadvantage of needing to clean around rivets instead of an even cleaning surface. The Calphalon option also comes with Cool-V style handles, designed to ensure proper air flow, and maintain a lower temperature in the handle while cooking over direct heat. Additionally, the five tempered glass heavy-duty lids trap in moisture and heat, while minimizing condensation. This assists the cook in keeping an eye on food even when covered. Reviewers of the Calphalon Tri-Ply Set have praised their ease of cleaning in both the sink and dishwasher. That’s right, they are dishwasher safe! That said, Calphalon mentions in their website and in the booklet included with the cookware set that hand washing assists greatly in maintaining the beautiful finish of stainless steel. To clean by hand, it is important to let the pans cool down after cooking (standard with all cookware, regardless of quality). Once cooled, let the pan soak in soapy, hot water. After this, most baked-on material will wipe off with ease. It is recommended to use Bar Keeper’s Friend (the powder) to maintain a new-looking polish on the cookware. Additionally, it is always good practice to use medium heat versus high. This is not only standard with this type of pan, but is also standard with high-quality cooking. Aluminum and stainless steel pans do not require the level of heat that lower quality, cheaper pans do. Also, don’t force-flip meat when searing. The fat in meat will cause it to stick to the pan. When seared to the proper level, the meat will separate from the pan naturally. Don’t force it. The stainless steel and aluminum Calphalon pans are oven safe up to 500 degrees F. Being careful with the extremely hot handle, you can safely move these pans from stovetop to oven or broiler to put the finishing touches onto your most favorite dishes. A full design overhaul of the Calphalon Tri-Ply line was enacted in 2010, allowing the product to be utilized on induction cooktops. 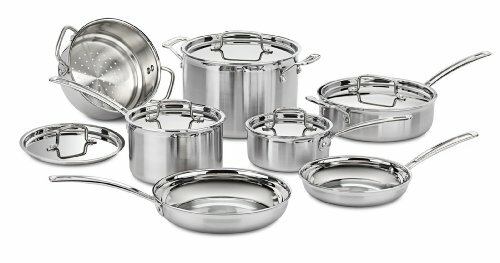 Also, Calphalon offers a complete lifetime warranty on all their stainless-steel lines of cookware. This warranty covers defective workmanship and broken materials when used for normal household cooking tasks and cared for in accordance with the included instructions. Customers on Calphalon’s website seem very happy with their purchase, with an average rating of 8.4/10. Those numbers hold up on popular online stores around the net. 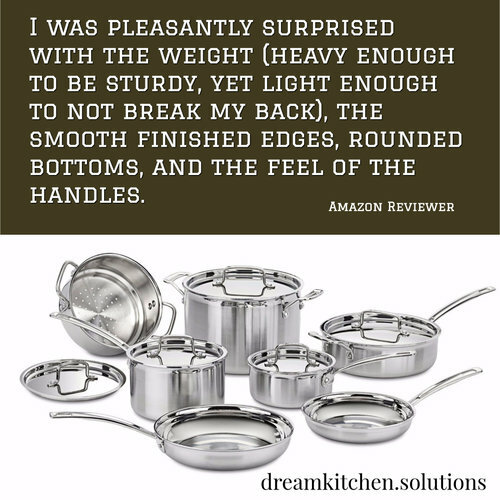 People love the quality and durability, and rave about how consistent their cooking has become. Minor complaints include the design of the handles and the fact that the largest pan doesn't come with a lid. The Anolon Advanced Hard Nonstick cookware set was developed from very heavy gauge hard anodized aluminum. This incredibly thick aluminum set will deliver a far more even heat distribution than stainless steel sandwiched alternatives, and will not dent or warp with excessive usage. The Anolon Advanced Set has both a professional and sophisticated outside appearance. One of its draws is the coloring, as not being stainless steel it can be coated in a color. There are two options: black and warm bronze with deep chocolate colored inside. Both versions have lids made of domed glass. Additionally, the Anolon Advanced model of cookware comes with Anolon’s proprietary handles called Sure Grip. These handles are developed with stainless steel, coated in silicone rubber. This provides an incredibly comfortable and secure grip on the pan. Also, as there is no plastic involved, the handles are oven safe up to 400 degrees Fahrenheit. These handles are bolted to the pan with two rivets, ensuring an extra strong connection and keeping the handle from snapping off the pan like the fate of many low-quality alternatives. Anolon’s Advanced Hard Anodized Nonstick 11-Piece Cookware Set comes with domed and tempered glass lids that have strong shatter resistance. 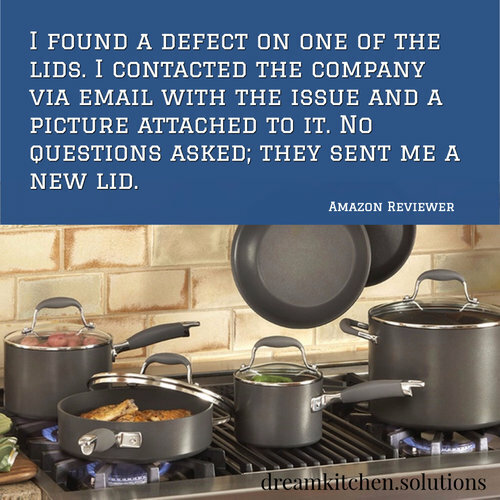 The lids are a tighter fit on pans than the other two options, which enables a more thorough seal for cooking assistance. Glass lids are a huge bonus, as they allow the chef the opportunity to keep a close eye on their food without breaking that heat seal and lose steam. Much like Anolon’s little brother brand Circulon, their cookware uses the Autograph 2 coating for non-stick purposes. This coating is developed by DuPont, the same company that produces the ever-popular Teflon coating. The Autograph 2 coating can be thought of as high-quality Teflon. It’s three-layer nonstick coating is applied to not only the inside, but also the outside of the Anolon pans. DuPont states that Autograph 2 is one of the most advanced non-stick coatings on the market, the perfect option for cooks searching for a balance between quality, lifespan, and performance. This coating has been restaurant tested by professional chefs for their seal of approval. This means that the coating has the capacity to withstand heavy use and abuse, and is even safe to use with metal utensils. The Anolon line is not broiler safe, as the pans are only rated up to 400 degrees. It is never, ever recommended to use non-stick coated pans under such high heats in the first place, as it rapidly deteriorates the coating. Broiler temperatures can easily reach over 500 degrees, at which point non-stick coating would begin to lose its properties and begin to crack and break. The Anolon Advanced Hard Anodized Nonstick 11-Piece Cookware Set is not dishwasher safe, in accordance to manufacturer instructions. However, as the interior and exterior are non-stick coated, hand-washing is a breeze. To clean by hand, it is important to let the pans cool down after cooking (standard with all cookware, regardless of quality). Once cooled, let the pan soak in soapy, hot water. After this, most baked-on material will wipe off with ease. It is recommended to use Bar Keeper’s Friend (the powder) to maintain a new-looking polish on the cookware. Also, unlike the Celphalon option above, the Anolon model is not compatible with induction cooktops. But like the Celphalon, it comes with a lifetime warranty, covering defective workmanship and broken materials when used for normal household cooking tasks and cared for in accordance with the included instructions. Customers on Anolon’s website seem ecstatic with their purchase, with an average rating of 9.4/10. Those numbers are slightly lower across other online stores, but still average out at 8.8/10. There is consistent praise for the build quality of the set and the impressive durability. The color, rubber on the handles, and super customer service are also frequently commented on. The downsides include exposed metal getting very hot on the lower end of the handle (away from your hands, but still not ideal). The handles of the Cuisinart pan set have two rivets securing them to the pan, ensuring a sturdy connection. These bolts fastening the handle to the pan work worlds better than a low-quality pan set’s welded-on handle. As with the Calphalon option above, this comes with the potential disadvantage of needing to clean around rivets instead of an even cleaning surface. The Calphalon option also comes with stainless-steel handles designed with thumb rests, ensuring proper air flow, and maintain a lower temperature in the handle while cooking over direct heat, while offering a sturdier hold on the pan itself. Also, if you’ve ever attempted to pour from a pot without a rim, watching in sadness as the liquid spills or drips down the sides all over your counter or hot cooktop, Cuisinart has your solution. The pot rims are well tapered to allow for drip-free pouring. 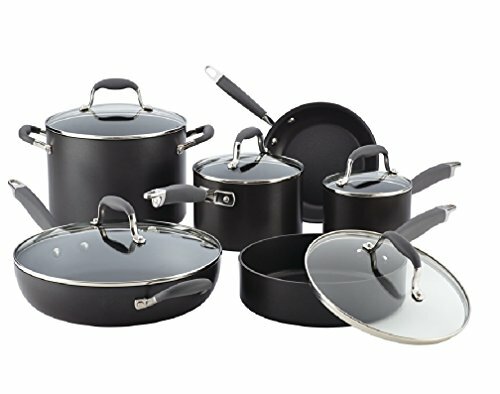 The Cuisinart Multiclad Pro 12-Piece Cookware Set can easily be the last set of cookware you purchase in your lifetime. Ensuring cooking on medium to low heat and usage of nylon or silicone cooking utensils will provide a far extended lifespan of the cookware as well. Hand washing is a breeze as well with the stainless-steel Cuisinart cookware. To clean by hand, let the pans cool down after cooking (standard with all cookware, regardless of quality). Once cooled, soak the pan in soapy, hot water. After this, most baked-on material will wipe off with ease. It is recommended to use Bar Keeper’s Friend (the powder) to maintain a new-looking polish on the cookware. The stainless steel and aluminum Cuisinart pans are oven safe up to 500 degrees F. Being careful with the extremely hot handle, you can safely move these pans from stovetop to oven or stovetop to broiler to put finishing touches onto your favourite dishes. The Multiclad Pro series is also compatible with induction cooking. It’s important to note, however, that the previous line of Multiclad cookware was not compatible, only the Pro version is. And like the Celphalon and Anolon cookware above, it comes with a lifetime warranty, covering defective workmanship and broken materials when used for normal household cooking tasks and cared for in accordance with the included instructions. Customers on Cuisinart’s website seem very happy with their purchase, with an average rating of 9/10. Those numbers are slightly lower across other online stores, but still average out at 8.8/10. Positive reviews focus on their appearance and weight - generally the whole superior 'look and feel' of the product. The handles don't get hot and the rounded bottoms minimize scratching on your glass-topped stoves.